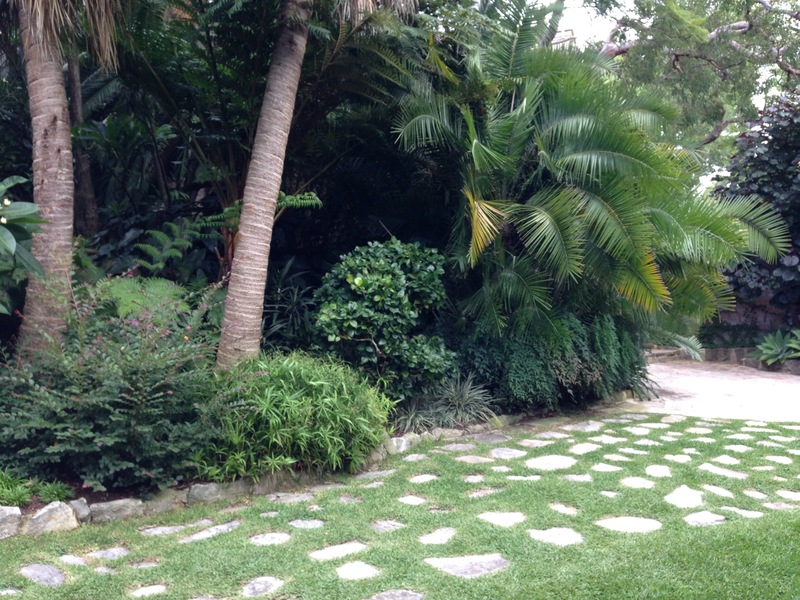 Sometimes gardens invigorate you. Bright colours, abundant planting, striking artwork and sharp lines can all have this effect. Sometimes gardens soothe you. They are a place of harmony, tranquility, cool colourings and simple, flowing shapes. Sometimes gardens utterly confuse you and invigorate and soothe you all at the same time. 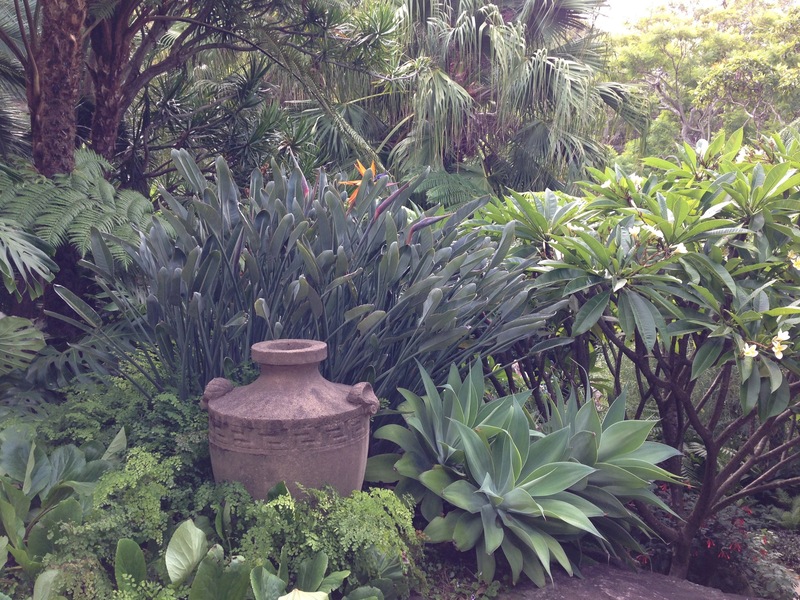 Christopher Owen’s Vaucluse garden, opened as part of the Hidden Design Festival was one of these gardens. 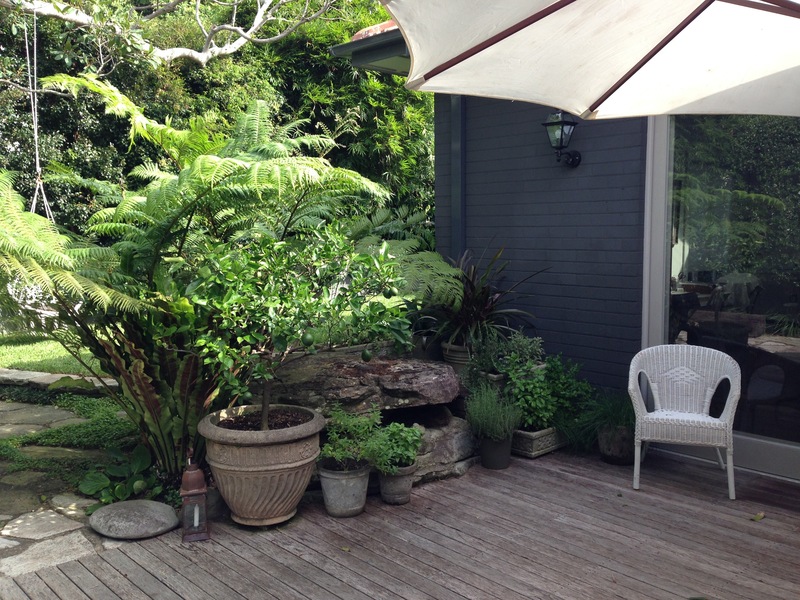 We had trekked from inner Sydney, through the traffic, at the very end of two extremely busy garden viewing days. We were tired, we were pretty much ready to go home and as we drove along Vaucluse Road, looking (and failing to find) yellow balloons, there wasn’t much left in the tank. We eventually shuffled through the gate, to be greeted with the widest smile in the world by Ceara, Chris’s gorgeous wife (who incidently, shockingly introduced herself simply as ‘Chris’s wife’). We were now inside the stone wall and tall Murraya hedge and we all took a deep intake of breath and sighed a huge, relaxing sigh. The owners of the garden, Cynthia and Andrew, plus Chris, all welcomed us as if long lost friends having battled through snow for thousands of miles to get there. There were hugs and cups of tea on offer and excited stories of how the weekend had gone, as the last few visitors (but us) departed. Admittedly, Chris was a friend of Catherine’s, but that was where the existing connections ended. Chris told us stories about how he had worked with Cynthia over the last 18 months and Cynthia, separately, told us the same stories from her perspective. There was an incredibly special relationship there. Both strong characters in their own ways, but both finding each other hugely stimulating in their joint passion to work with the existing framework to absolutely maximise the potential of this space. We heard how Cynthia rejected some ideas, only to come back later, admitting that Chris was right. We heard how Chris, over time, warmed to some of Cynthia’s ideas. It was clear that the greatest respect was held in both directions and the passion for creating the garden was equally strong for both. The feeling of soothingness came from the joy and comfort exuded from those there that day. 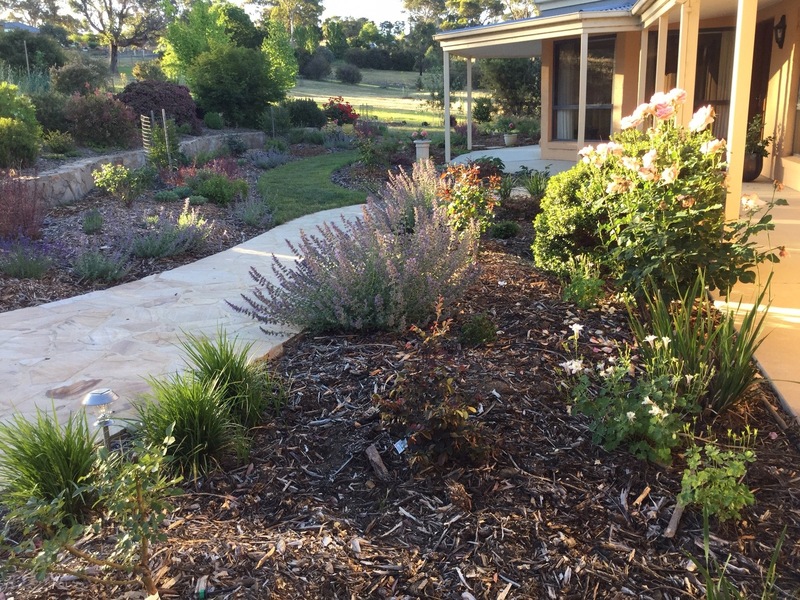 It came from the harmony in the planting compositions – each plant having a clear place in the scheme and complementing all of those around it. It came from the sense of being in a secret oasis, behind that big hedge and solid wall; just a stone’s throw from the bustling harbour, but in a peaceful, tranquil, private retreat from the world. The feeling of energy came from the passion, so obvious, in all three garden makers’ faces. 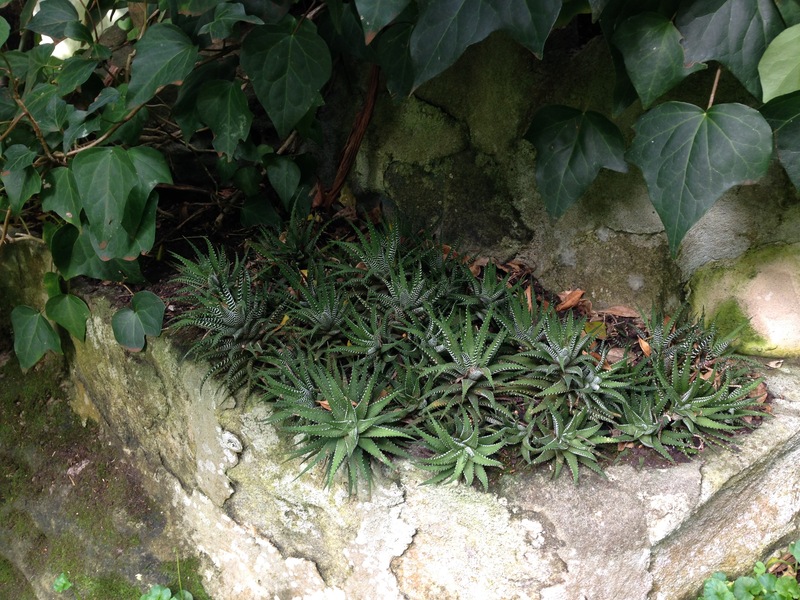 It came from the fullness and lushness of the planting and the little, individualised quirks. It came from the life that the plants, so vigorous and so healthy, breathed out to the world. And it came from the inspiring atmosphere of happy people sharing a place that they loved. 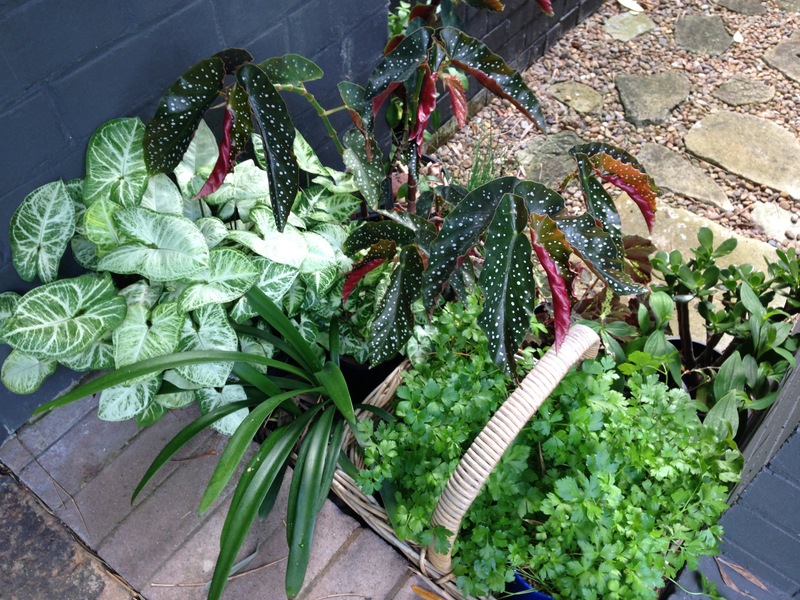 The planting, so full of contrasting, yet complementary textures; unified in its boldness and lush, green colour. Layer upon layer of detail that draws you in and holds you there; something more to see with every look. You know a garden is good when it somehow meets all manner of seemingly contradictory objectives. As if by magic, when you do the BOLD, FIT, CHARACTER test, it just happens to come up trumps on all three. 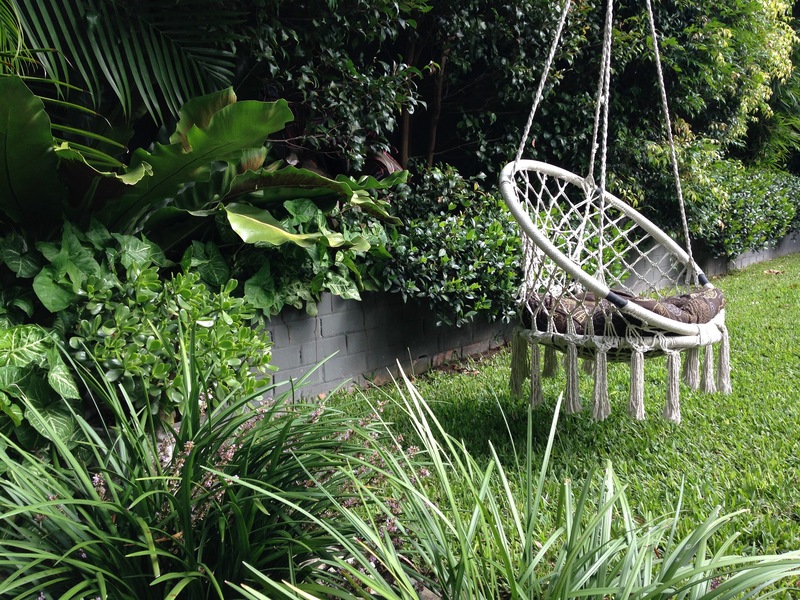 It is nothing if not bold, it is perfectly Sydney and there are plenty of quirks, varied plant material and integrated soul through its strong connection with its owners, that provide the necessary character. 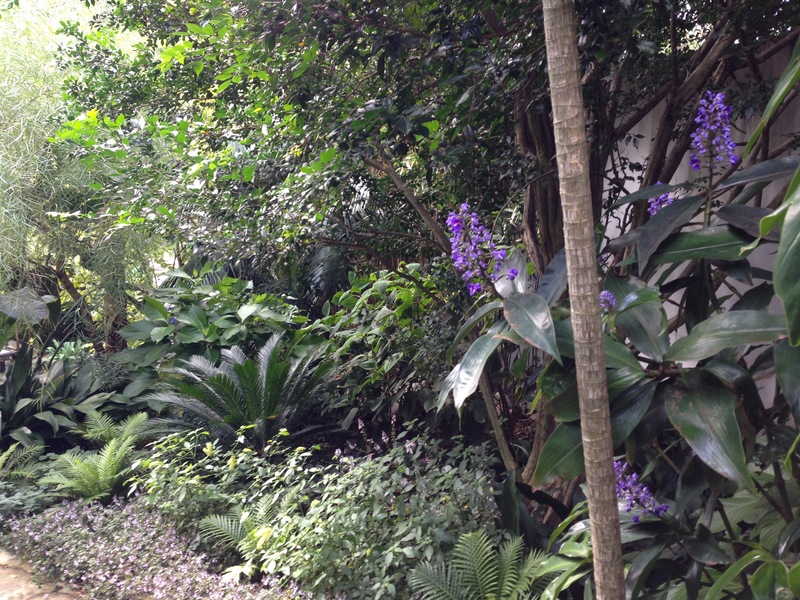 Sometimes gardens wrap you up and transport you away to another world. They give you the warmest, most content glow imaginable. The occasions when we get to experience that transportation are ones that we never forget. Everything feels right in the world for a moment in time. 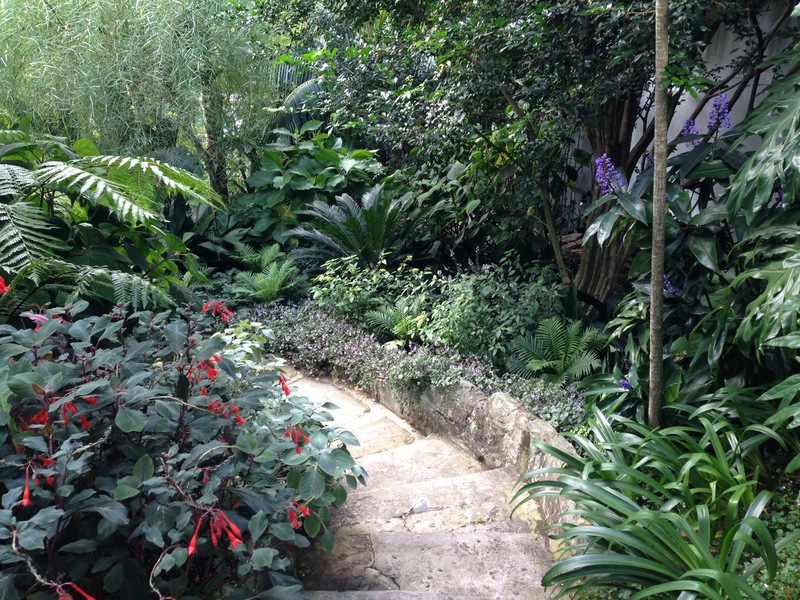 This garden appears so private and relaxing, yet I expect it has close neighbours – a great planting scheme. 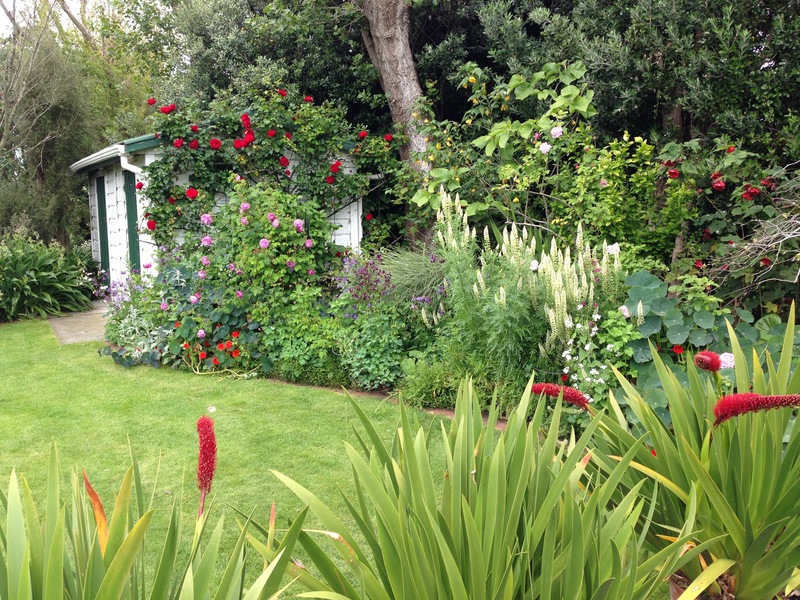 Also quite masculine, seems like the sort of garden most chaps would relate to – I love the pops of colour here and there. This is a large plot for Sydney but the planting is indeed very clever to screen out all that surrounds it. 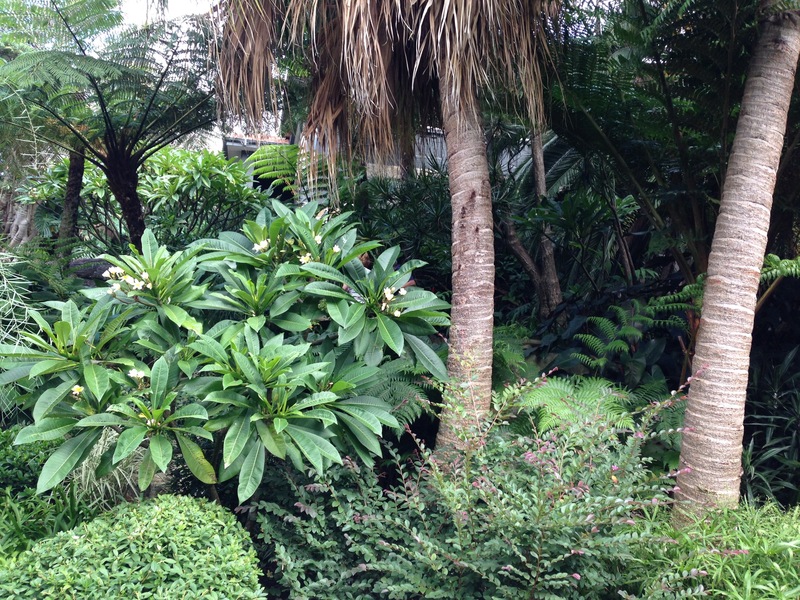 I think Sydney gardens are generally very foliage dominated. 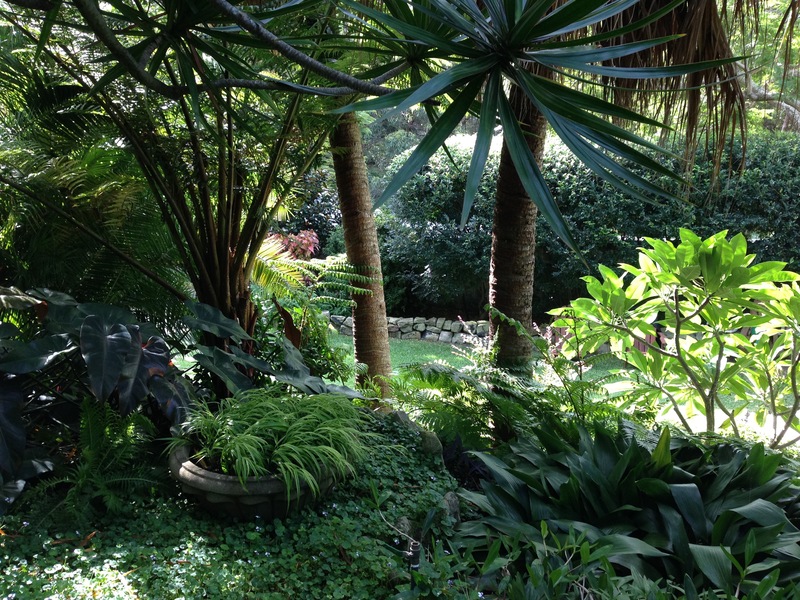 I’ve seen 16 magnificent Sydney open gardens in the last fortnight and I’ve got a few thoughts bubbling away in my head…..beware of these coming out in a blog post near you soon!! What a superb garden. 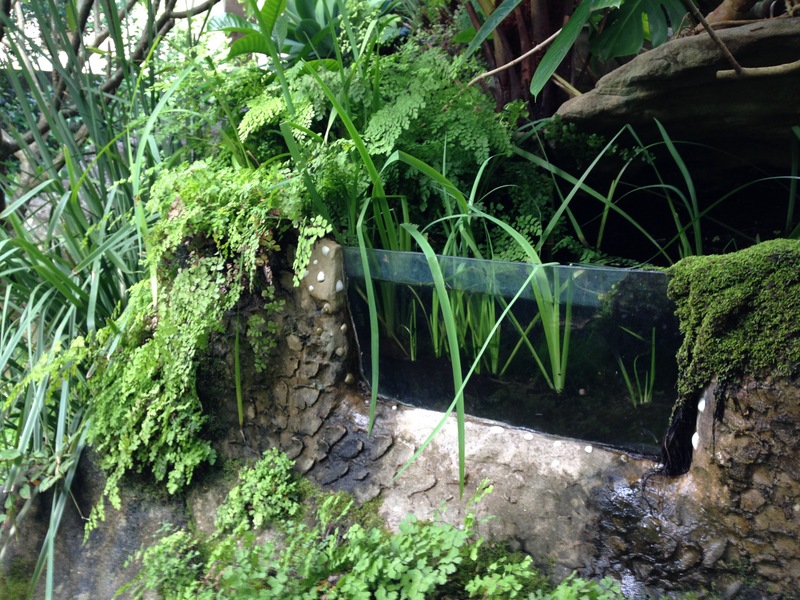 Even a frog pond … divine. But no native or indigenous plants that I noticed. Of course you can’t have everything. I love the layers and the fullness of the planting. I have great difficulty in achieving those things. There is always a very fine balance between over and under planting, isn’t there? 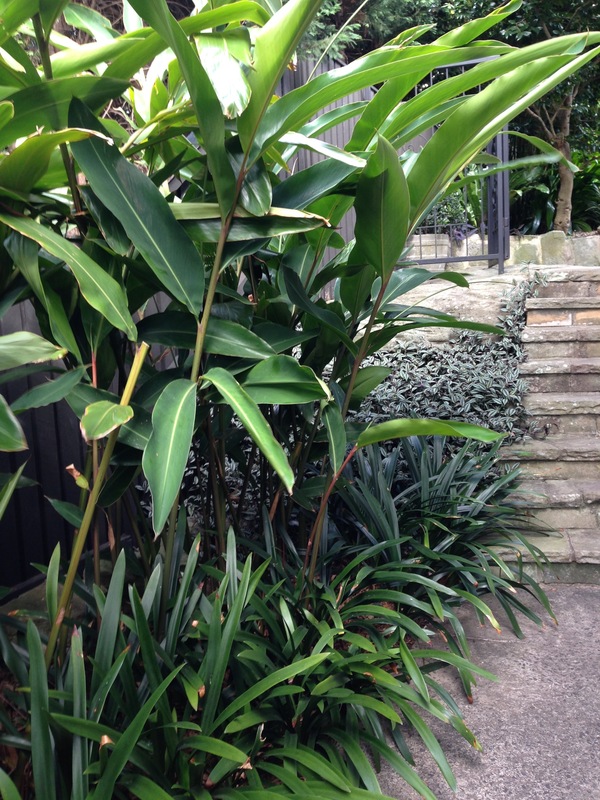 I love an abundant look but equally I think most plants look best when they are more or less at their natural size. 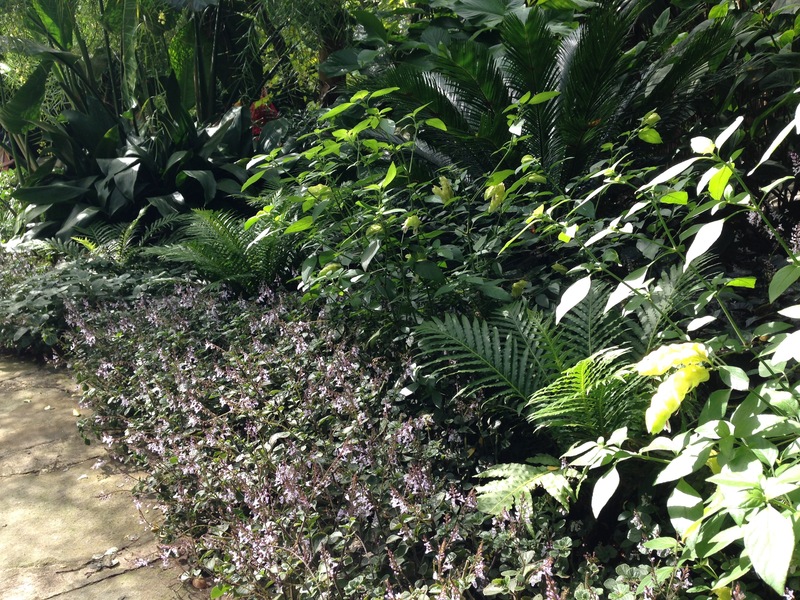 No, not a huge number of natives, although most of the ferns were and you would definitely have loved the violet lawn (you can see a little of it in the tenth photo) – it was stunning!